Hurrah hurrah the London 2012 Games are in full swing and London is a very exciting place to be right now. Have already visited a London live site and seen the torch relay finale concert, chased around the city looking for the life-size (!) Wenlock and Mandeville statues, eaten Swiss chocolate at the House of Switzerland, seen the giant crochet lions at the Natural History Museum, and thoroughly enjoyed watching the opening ceremony on telly last night. 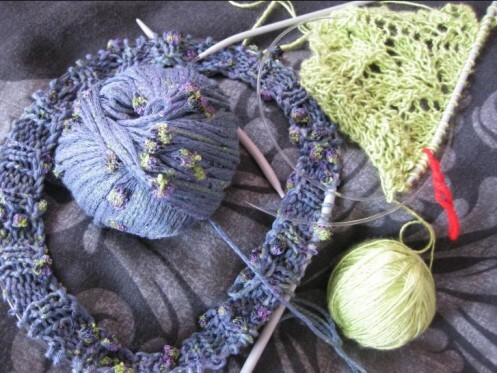 And now onto the important bit, what I’m knitting during the games. The Ravellenic Games are the Ravelry knitting community’s yarn challenges when the awesome people on Ravelry come together to knit our socks off (or on) for 17 days. I wasn’t able to knit through the opening ceremony so have only made a tiny start on the first two projects. I haven’t committed to any really massive projects. I’m just going to work on lots of little ones, including entering a few frogging events to frog back some old projects I don’t want to finish. My goal is to aim for more than 8 projects frogged, finished or started, as 8 is the most medals any athlete has ever won at one games. In the green lane is the Lacy Kerchief Scarf which is probably going to be a little too ambitious for such a short time period, but is working perfectly with the yarn which has been in stash for over a year, allowing the project to be entered into the lace longjump as well as the synchronized stash busting. In the grey lane is the JC Slouchy Hat, a quick and plain hat pattern which will hopefully show off the shiny bobbly pigeon coloured yarn beautifully, win me a medal for the hat dash and not be taxing during moments of exhaustion. Go team GB! I look forward to seeing your haul of triumphant knittery at the end of all this Olympic merriment. Hope there is some triumphant knittery at the end! Flailing a bit, but hope to pick up soon and hope Team GB hang on in there too!